Elle: This past Wednesday we had a great time hanging out with the Boston Triathlon Team (BTT) at The Asgard in Cambridge (of course we had to order the truffled tater tots while we were there). 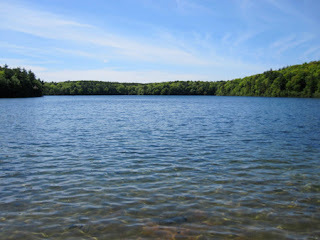 Ed Galante, who originally introduced us to the BTT, invited us to join them on Saturday for a swim at Walden Pond, followed by a bike ride around Concord. That all sounded good to us, so Saturday morning we got up at 6am, ate a little something, packed up our gear, and headed out to meet the team by 8am. Ed couldn't make it, but we met BTT coach, Jorge Martinez, the owner & head coach at E3 Training Solutions. Noah was there, who we had met at The Asgard, with his girlfriend, Brenda, as were a handful of other athletes. Webb: This was my first time swimming in historic Walden Pond. I went to the pond to swim deliberately, to front only the essential elements of open water swimming, and see if I could not learn what the water had to teach, and not, when I came to race, discover that I could not podium." (Cf. Henry David Thoreau, Walden.) We swam from the main beach area directly across the pond, about a half-mile across. As we approached the water, Elle pointed out the yellow-green film of pollen along the shore line. On that first swim over, I had to stop about 10 times to cough. Was it the pollen? Or maybe the wetsuit squeezing the extra pounds since the last time I wore it? Who knows? Fortunately, the return swim felt great. Unlike cycling and running, I have no sense of pace in the open water. Elle: The water was nice, the weather was great, I was excited to jump in and do this thing. But the whole way across, I had trouble getting my breath. That worried me. When I finally reached the other end of the pond, I checked my wetsuit and realized I had pulled the top tab too tight, basically half-strangling myself. Once I loosened it, all of a sudden everything became a lot easier. The swim back was better, but the whole experience made me realize that we need to do A LOT more open water swimming. 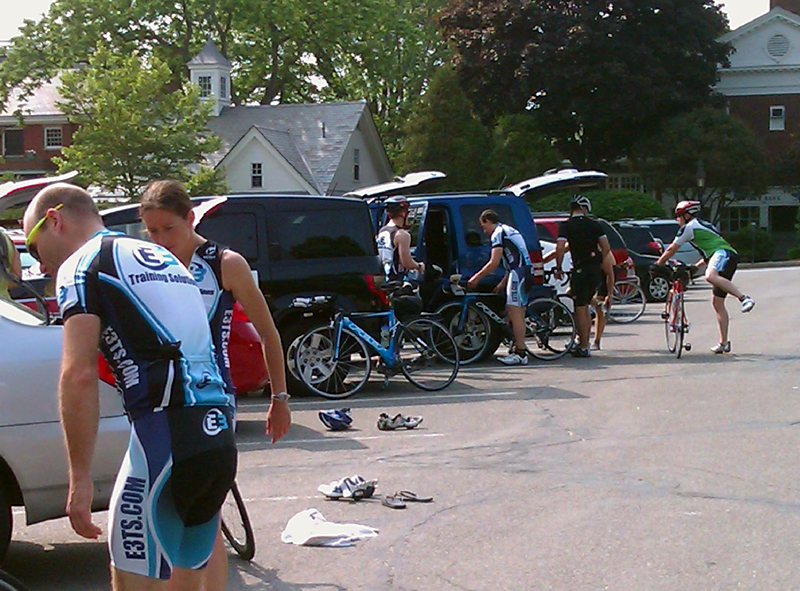 Webb: After all of the BTT'ers assembled on the shore, we drove over to Concord Center to park and get our bikes ready. Concord is famous historically for both its role in the War for American Independence and its place in American literature, especially in the 19th Century. What may be less well-known outside of MA, is that it is a welcome junction for cyclists. Many other cyclists were either riding by or joining us in the parking lot. Once everyone was geared-up, we got the rundown. There would be fast, moderate and easy groups. Having never ridden with this crew, we hazard a guess that we would be in the moderate group. But it was never clear who that was. We just rode out when everyone left. Within a couple of miles a group caught and passed us. The fast group? Probably. I saw Noah drop off and seemingly go back. Since we didn't know the route, or the area really, Elle tucked in behind my back wheel and we pressed to keep our original group in sight. We were able to keep them within 200 meters, but never closer, for about 10 minutes. Then Noah caught us. He had been time-trialing to reach the group. When he caught us, we organized into a pace line with the intent to bridge-up. Problem is we did not know which route the group was riding. With Noah leading us, we ended up riding around the beautiful Concord-Bedford area. It provided Elle a good opportunity to work in a pace line. Now if she could just stop Schlecking. Elle: It was a good, hard ride. We had a nice pace line going for awhile, which I need to work on if I plan on doing any bike races. 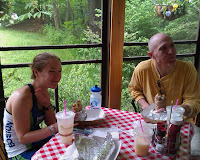 We eventually found our way back to the center of town, and went to grab a bite with Brenda while Noah went out for another lap. Eventually, BTT'ers started joining us. It was nice to hang out with people and talk about races, one's we'd done, ones coming up, etc. I'm looking forward to doing more of these events with BTT. 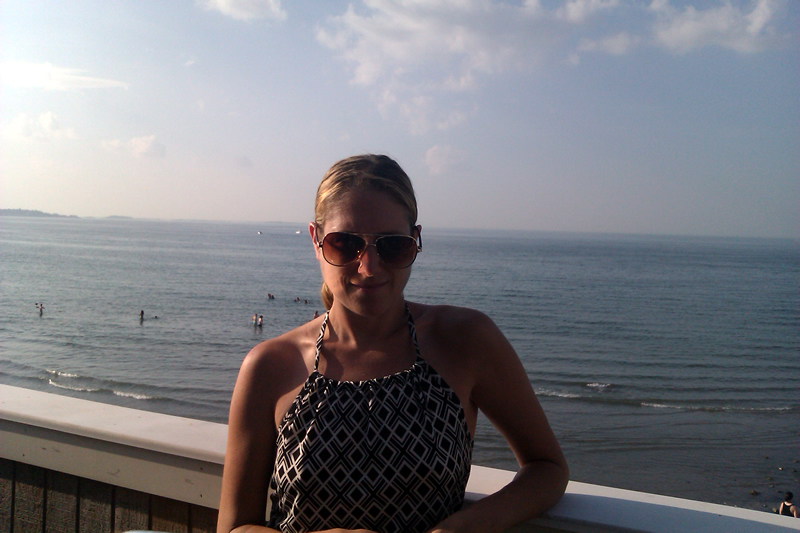 Later on that day, Webb and I headed to Nantasket Beach, and had a nice dinner, ocean side. Good times. Webb: We made plans to ride the Purgatory race course with our friend Lenny. The course is an 11-mile loop featuring some sneaky climbs, a good albeit short, tempo/time-trial section and the signature climb, the one that puts you between Heaven and Hell. Our intent was to keep the ride easy and aerobic. As I like to say, let the hills do the work. Lenny was riding with a purpose so he took off almost immediately. I took the lead on the first lap to show the way. I had Elle drive the second lap, not so much to pull, but to learn the route. We met up with Lenny after lap 2 and decided to ride a final 3rd lap as a group. What that actually meant is Elle was going to drive in first position again. Elle: I had to do this course if I am really planning on doing the race. It scares the hell out of me, but that's kinda what I do these days, it seems. The course is challenging, but do-able. My legs were tired from the day before, but I was able to keep up. I guess I still don't believe that I'm actually going to be entering a cycling race. But at least I'll know the course, so that's one less thing I'll have to worry about come race morning.